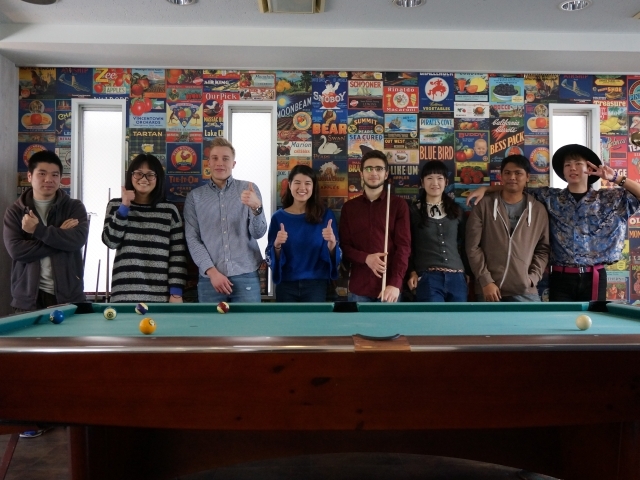 We managed approximately 60 sharehouses, mainly operated in Tokyo. So, this time we will introduce some sharehouses in Tokyo! 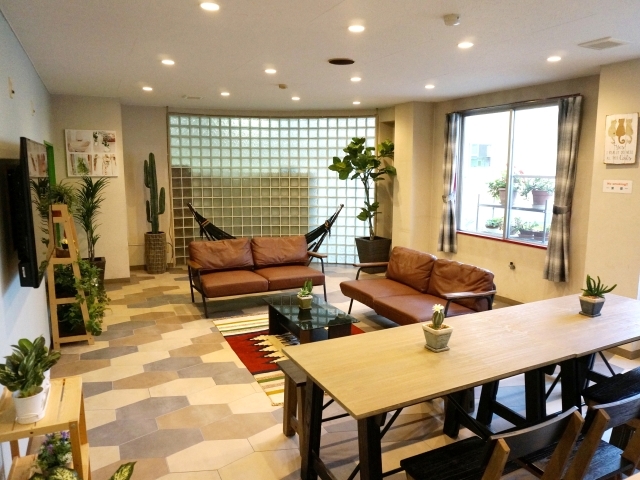 First House Omori is the sharehouse of all 32 rooms with being close to Omori station in JR Keihin Tohoku Line. 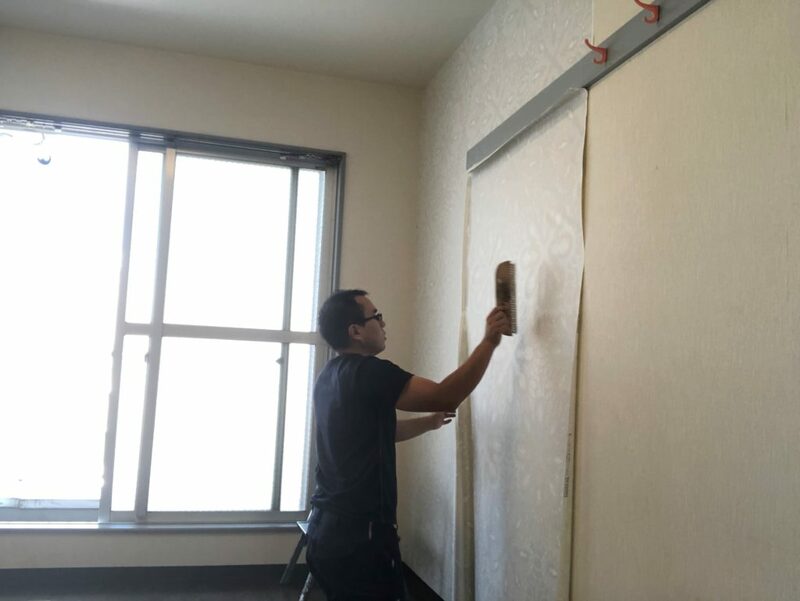 In the summer of this year, we did waterproof coating on the outside wall, renovated kitchen, living room, toilet, and the living room. It is a share house that got more appeal! 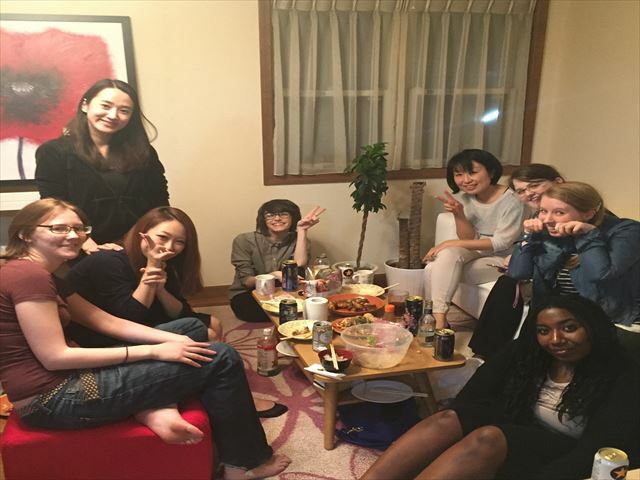 Also, we shared the time with residents in one room, in other sharehouses not only residents in Omori sharehouse in November. 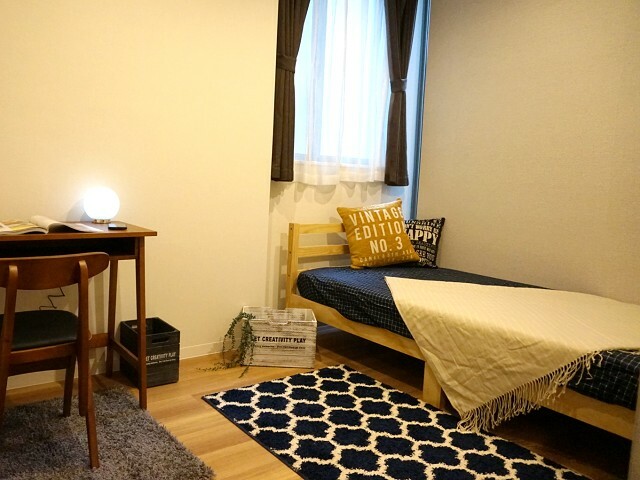 A one-room type property opened in the center of Tokyo, Shinjuku. 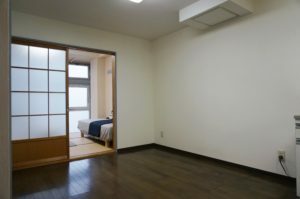 In general, when you try to rent in Shinjuku in the middle, rent 100,000 is required for security deposit, key money, joint guarantor etc. So hurdle will be high. 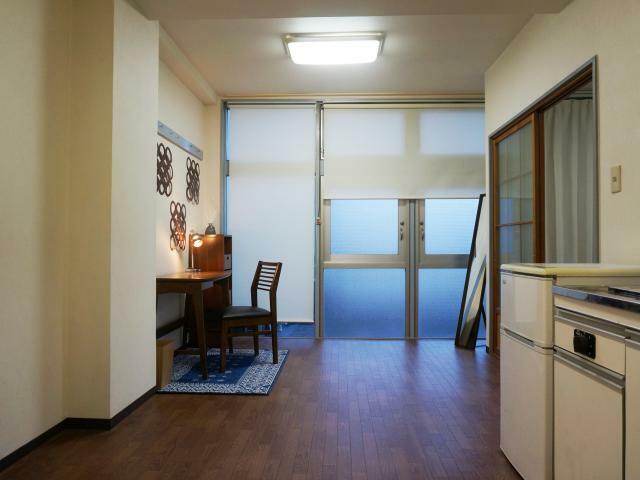 However, you can move in without any useless initial cost. 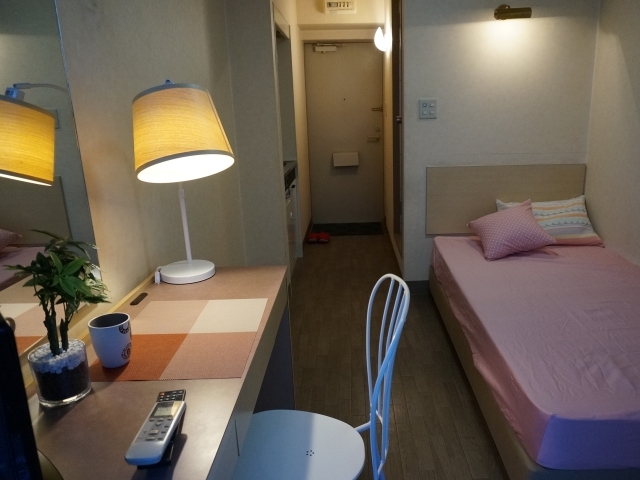 Furthermore, each room has air conditioner, refrigerator, as well as washing machine, dish, hair dryer, bed, desk and chair. So you can start the new life as soon as possible. So, customers are very pleased with those who move directly from overseas and who are coming to Tokyo from the district. The most pleasing thing may be the response of the staff and the followers’ trip. Also, a bicycle parking place is newly established and the location where the range of action spreads without using a train is attractive! This house is a shared share house for men and women, but we have a floor exclusive for women on 3F. It is a popular property for those who work locally. Toyosu came out more and more popular among domestic and foreign people with the relocation from the Tsukiji market increasingly. Why do not you enjoy the life in this place? 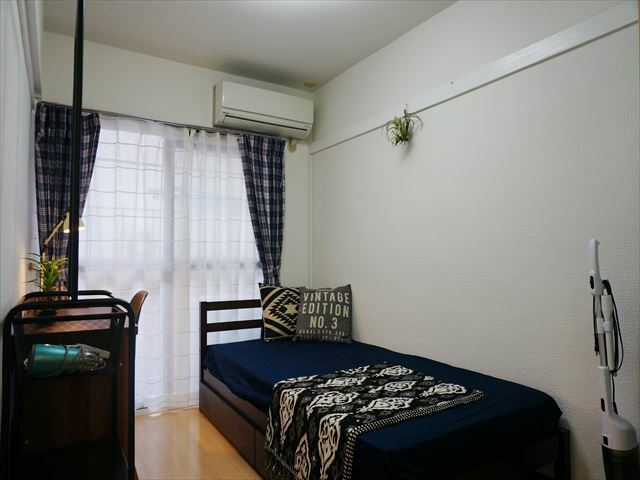 In addition, there are sharehouses in Tobu-Nerima, Kamishijukui, Nakano, Ikebukuro, Otsuka, Ueno · · · everywhere in Tokyo. Because I can not introduce with just this blog, it may be next time. Popular areas not only in Tokyo, but Mizonoguchi and Yokohama, Minami Urawa, Funabashi, Matsudo … etc. All the staff are waiting. Of course, we can deal with individuals and corporations, from one room to several rooms. 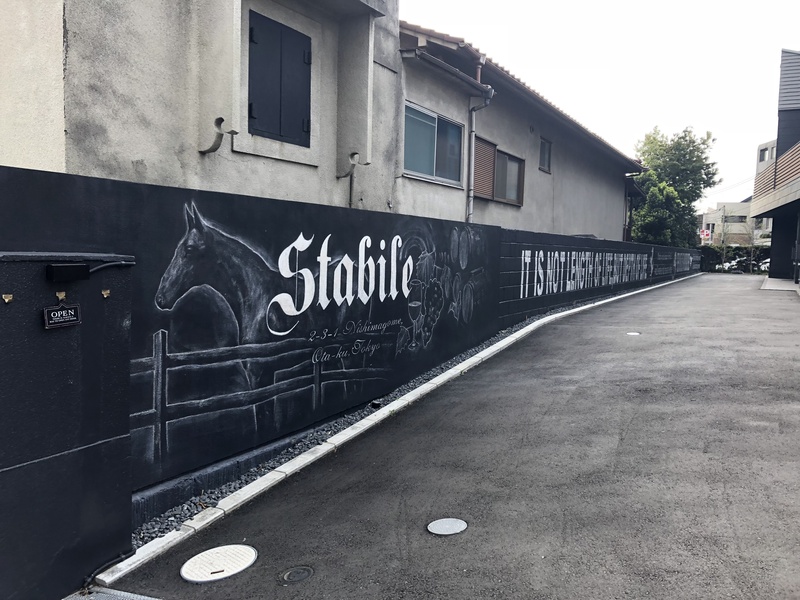 The house managerｓ of our company are in charge of some share houses. We go to lots of different places for the viewing and house maintenance everyday. So, we enjoy finding a good restaurant around the each places. 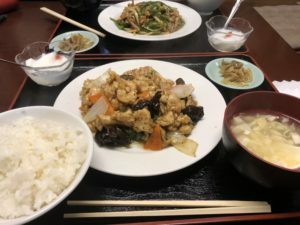 I would like to introduce the Chinese restaurant around Higashi-Nagasaki station. 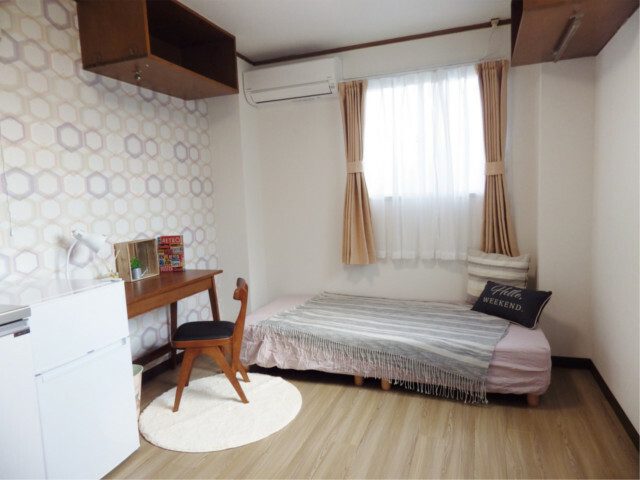 There is a new share house　『Cozy Share Ikebukuro – nishi』 where is near Higashi-Nagasaki station. The Chinese restaurant’s name is 『味源亭』.The restaurant is 30 second from the north gate of the station! 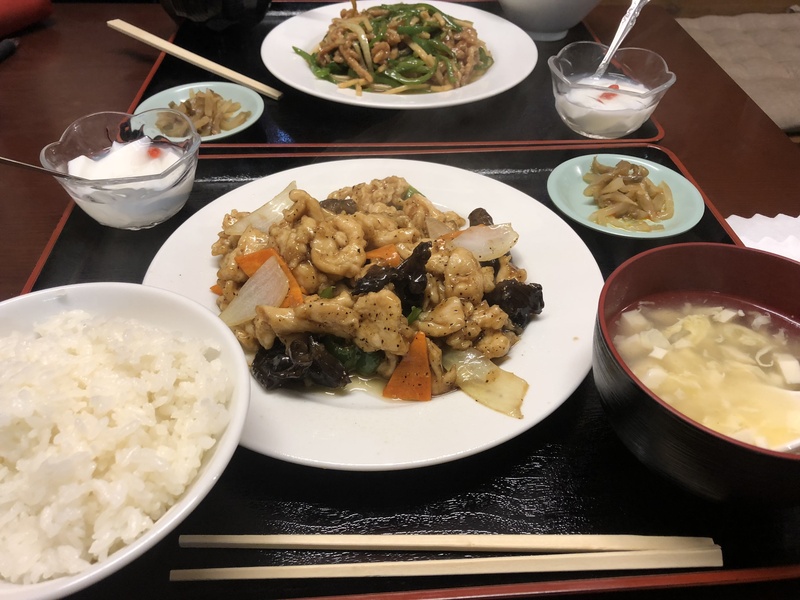 Today’s lunch special is only 550 yen! There are free refills for the rice and soup! And,we can get a dessert and coffee!That’s so Cheap! There are many cheap restaurants around the station. And, there are also many cheap grocery stores,supermarket and 100 yen store. 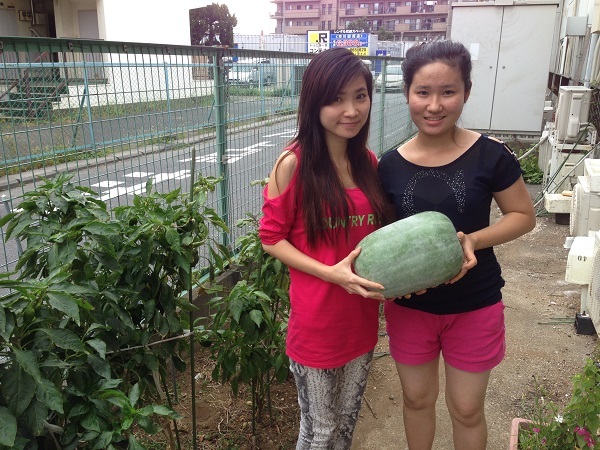 The Higashi-Nagasaki station is really nice place to live,even if you eat out or cook everyday. 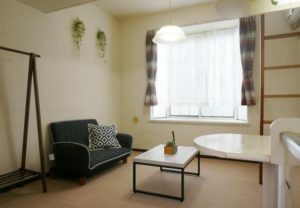 If you are interested in the Cozy Share Ikebukuro-nishi,please feel free to contact us! The third DIY @ Gumyouji where the new DAISO is just opened!! I did DIY (Do it yourself) again @ Firsthouse Gumyouji!! This time is the third one!! The first one was to fix walls in the living room and water sink. 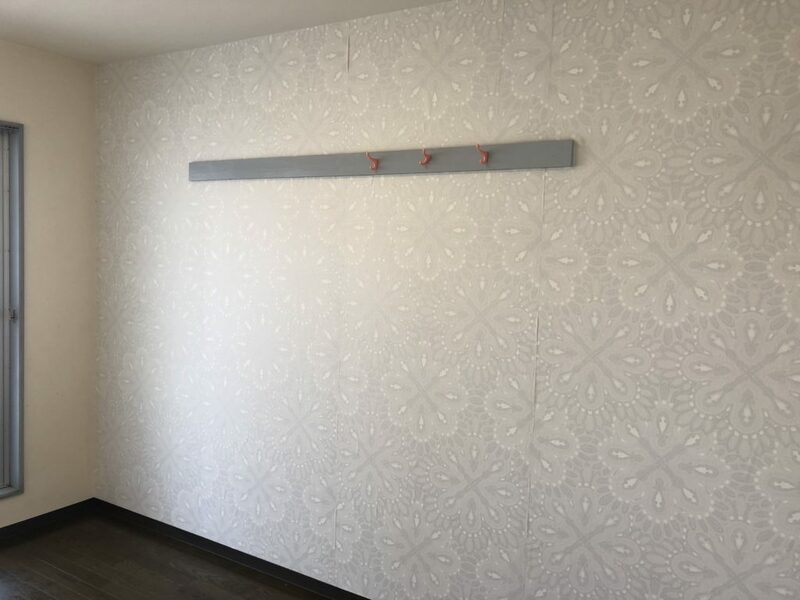 The second one was to replace the wall paper in a room. 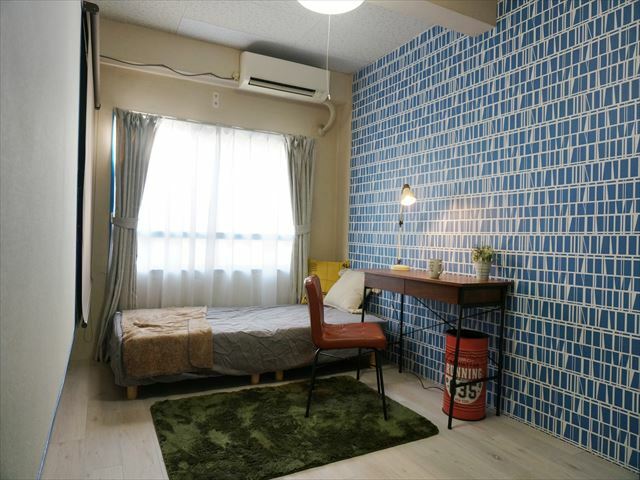 Firsthouse Gumyouji has 2 types of rooms, a normal private room with 6 tatami mats (about 10㎡) and 1DK. 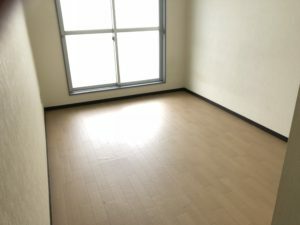 This time, I am going to change the floor of 6 tatami mats room! 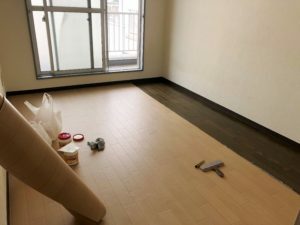 This time, I’ll paste the flooring material called CF (cushion floor) on the flooring. 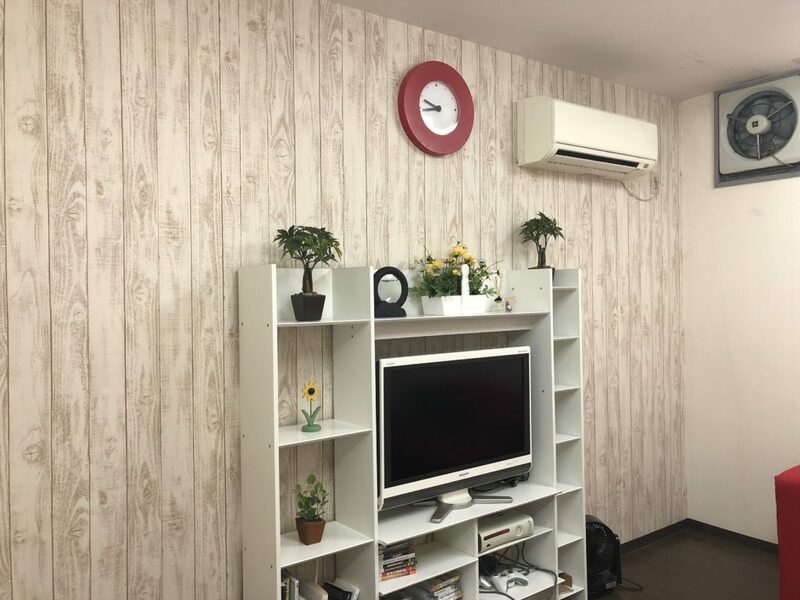 Since you can purchase CF easily at the home center, it is reasonable and popular for people who like DIY as well as wallpaper. 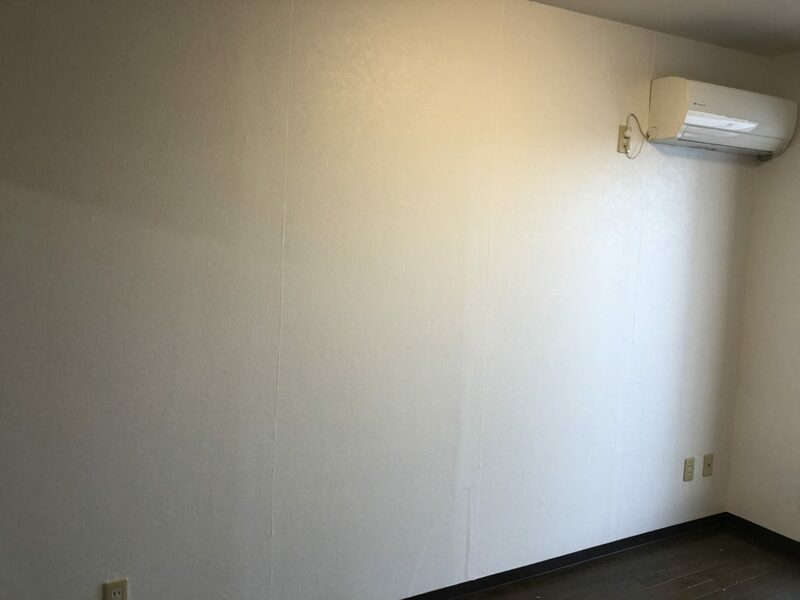 As most CF’s are about 180 cm wide and about 90 cm in size, if the room width is over 180 cm, you need to purchase both 180 cm and 90 cm. And here is the picture after completion. 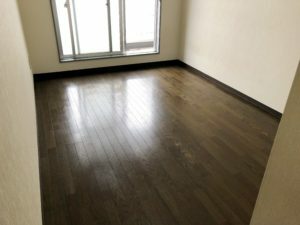 Originally, since the floor was black flooring, it may have given a dark impression. As the color got lighter, the room might look a bit wider. Then I put some furniture. Desk, chair, bed, curtain are brand-new ones. Compared to the first photo, it changed considerably! Also, because the screen door was also torn, I applied this again neatly. Since you can purchase webs and utensils at home centers. 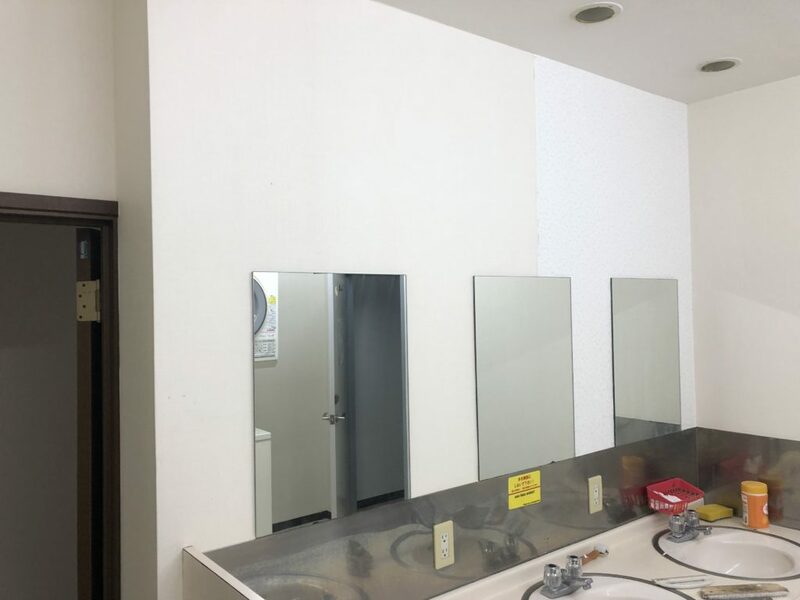 The newly emptied room is being repaired as needed from time to time. 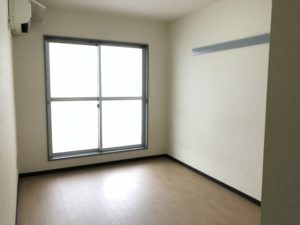 I am trying to provide everyone with a nice room. In Firsthouse Gumyouji, the common spaces and the interior are being repaired which we can do when in need, I think it is kept relatively clean. 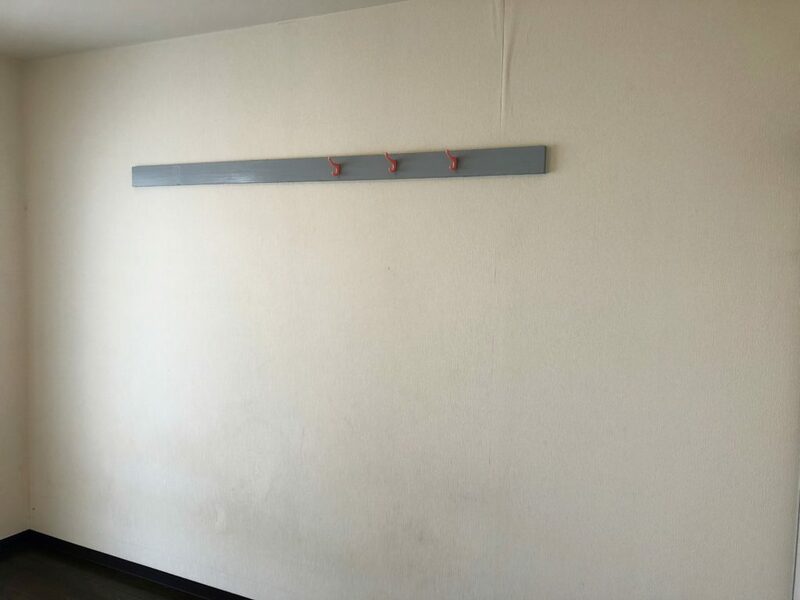 There are some residents who moved in a few months ago, and the others have lived in for a few years. 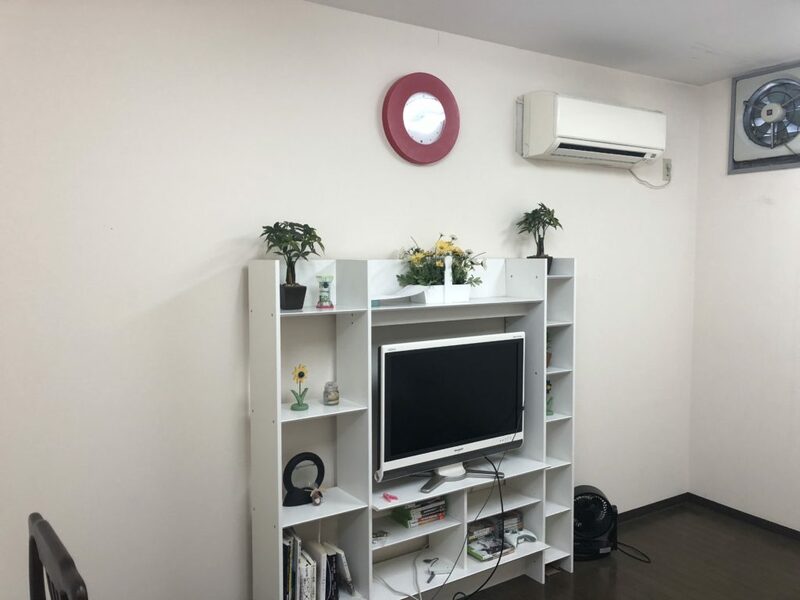 Originally, First House Gumyouji tends to have many foreign residents and we have many inquiries from abroad since it is very convenient to commute to Shinagawa in Tokyo and Yokohama in Kanagawa Prefecture. The equipment necessary for the house is now enough for even 100 yen shop to be enough, so I’m very happy!! 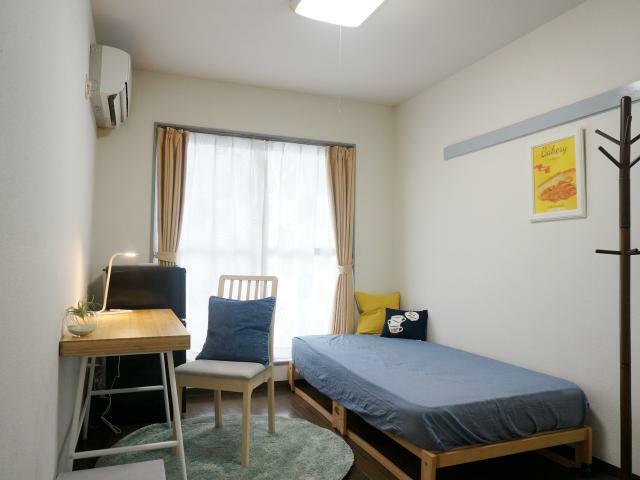 There is nothing to worry with life at shopping districts where vibrant downtown atmosphere drifts, near the station, supermarket convenience store, drug store, etc. I put a dining set in the room of 1 DK. Of course we also accept couple and friends! Let’s have fun together with Halloween and Christmas events!! It might be too late, but curry has been my fad lately. Here in Japan, there are many curry restaurants serving big nan bread and you can take it as much as you want, but today’s curry is Japanese curry with rice. 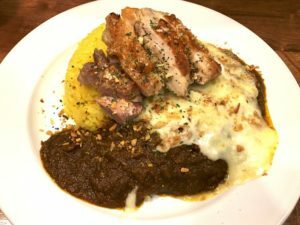 And today’s my curry diary is about a curry Restaurant “Yokohama Hammar“, just 24 seconds by walking from Hakuraku Station. Curry served here are free of gluten, flour and chemical seasoning. One onion is included in this meal and the taste was fruity. This time was chicken steak this time, but since I can also enjoy various other toppings, I will be looking forward to what to do next. There are not only two types of pickles on the table but also Nampura with blue peppers specialized in Hammar! I want to live by eating only this curry. It was my decided day. 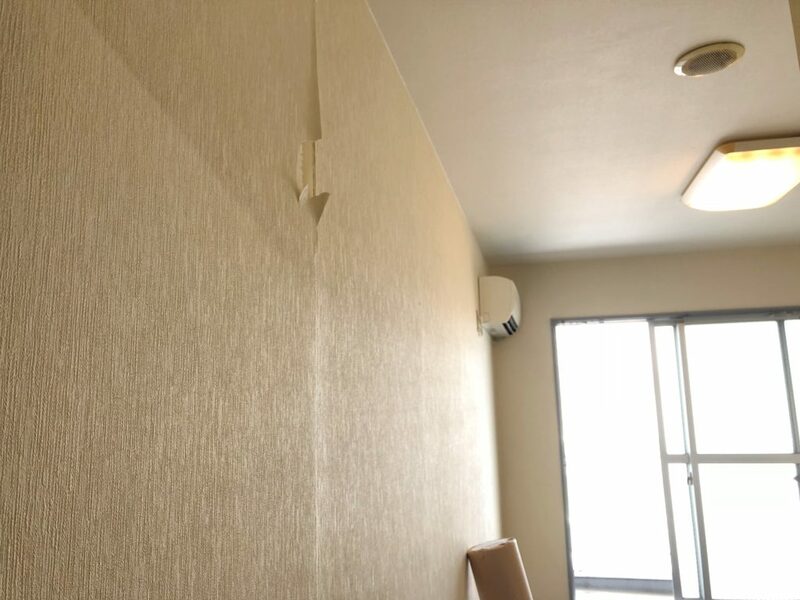 The blog of last week “It is DIY boom in Interwhao“、I reported the changes of wallpaper in the living room and water sink space at Firsthouse Gumyouji. 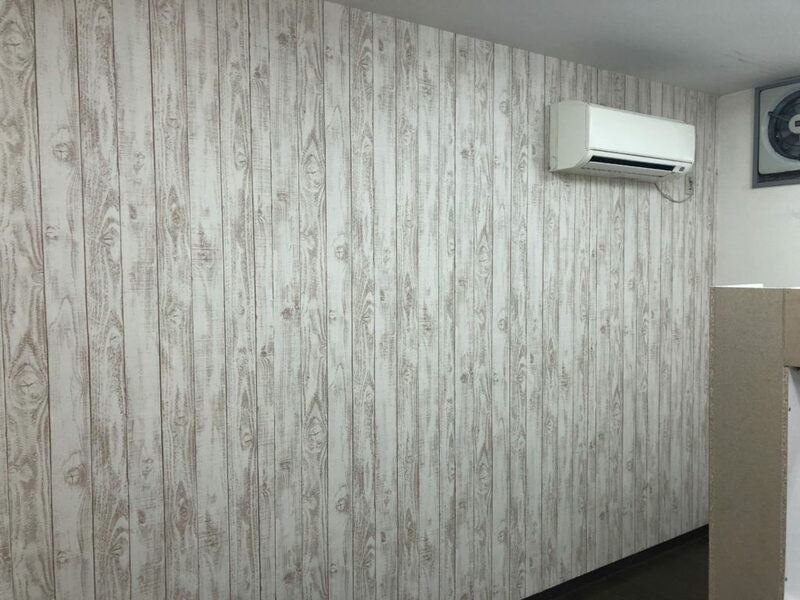 Then this time, I changed the wallpaper in a room!! For the room, if the time goes on, it gets dirty and it is not fresh to live in. 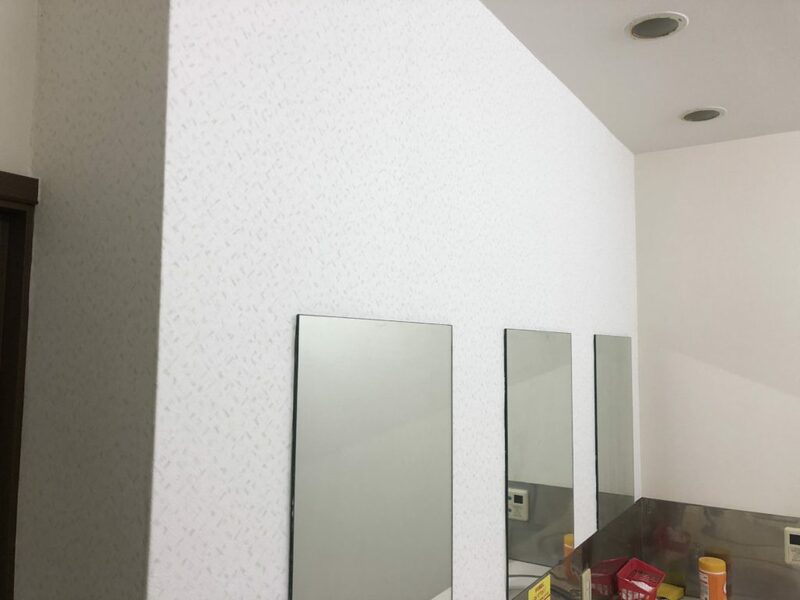 The wallpaper is based on a color of white with patterns. This room No. is 5. I wrote in the previous article but I paste glue by hand. If I paste too much, it will be uneven which is not beautiful. So I pushes out air and extra glue on the surface with brush. The picture above is when I push out air and and wipe glue. By the way, I say I’m an Interwhao craftworkman but I do property guidance as the daily work. Then I paste glue, cut, push out air, and repeat this procedure. Several joints are highlighted in some places, but we will paste the caulking to hide the joint. But I noticed that the handle was slightly off the line. 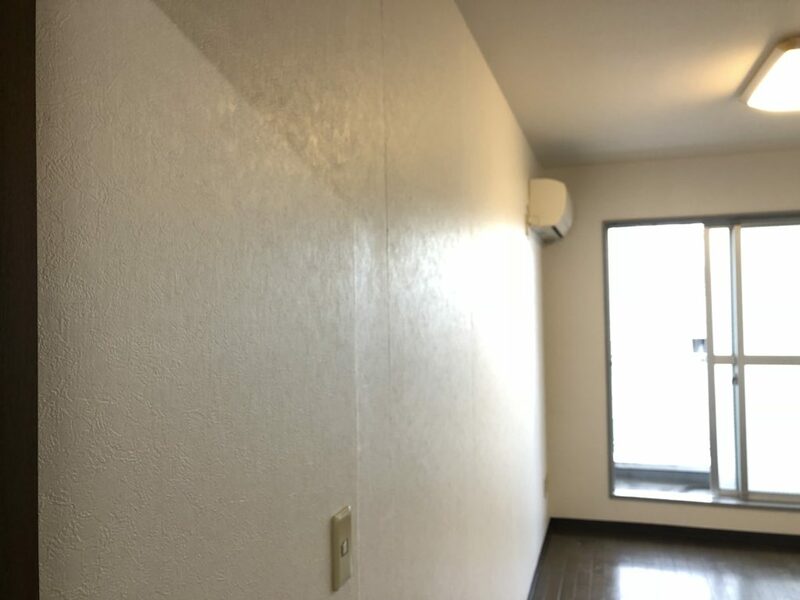 This picture is another wall after pasting. We don’t usually ask the pro to do this. We do what we can do. 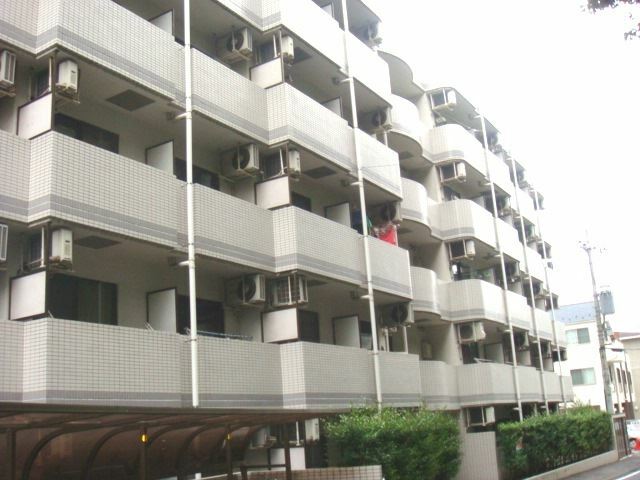 By this effort, we can provide a room with reasonable rent which is one of the Interwhao’s characteristic. I’m planning to change a wallpaper, furniture, and so on. So I will update the information as soon as I can! 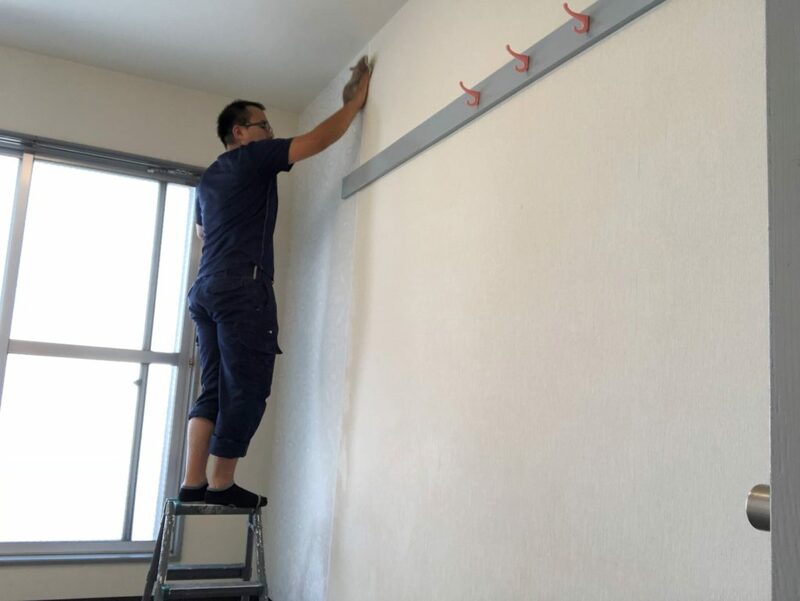 From the end of last year at the Interwhao, we are doing renovations that we can do by ourselves, so-called DIY with various share houses. Interior decoration is the main thing to say refurbishment. 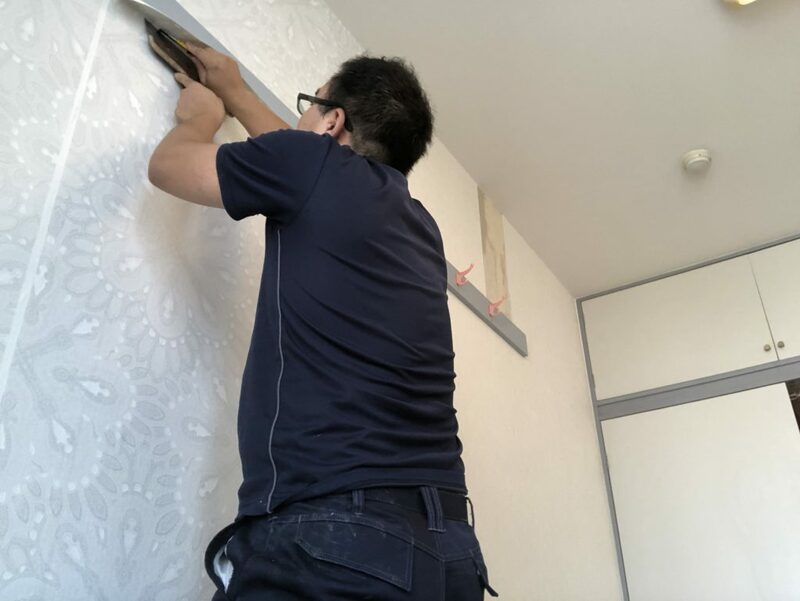 Each staff is working hard to change the wallpaper, change the CF (cushion floor), floor tile, carpet and provide better rooms to customers. 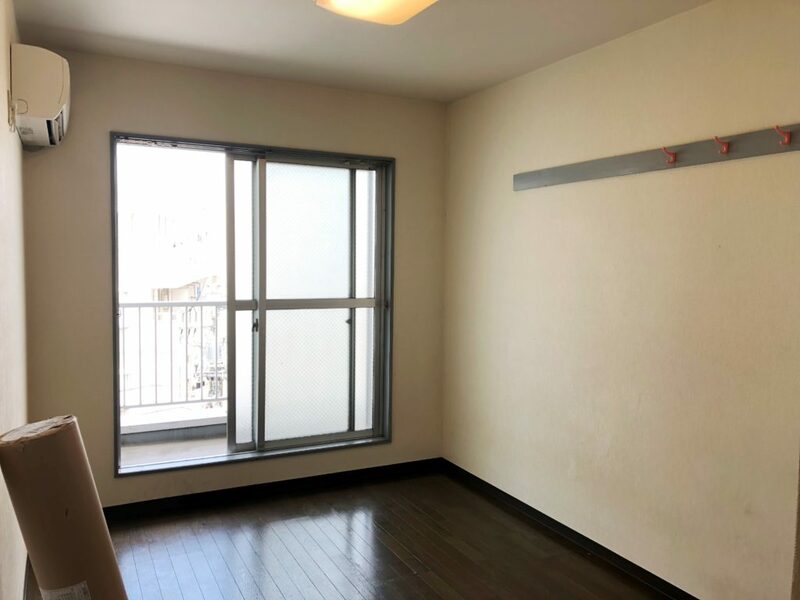 This property is located 3 minutes on foot from Keikyu Main Line Gumyouji Station, and 7 minutes on foot from Gumyouji Station on Yokohama Municipal Subway Blue Line. It is the best place to spend with friendly people who are full of humanity and humanity with the atmosphere of downtown packed in Gumyouji shopping area. In addition, there are many bakery shops, standing drinking Izakaya, and prepared meal shops near Gumyouji Station. Also, you get supermarket, convenience store, drug store, restaurant, and fitness gym as well. But the walls are wide, are not they? changing the wall changes the atmosphere a lot!! The first one is water sink. 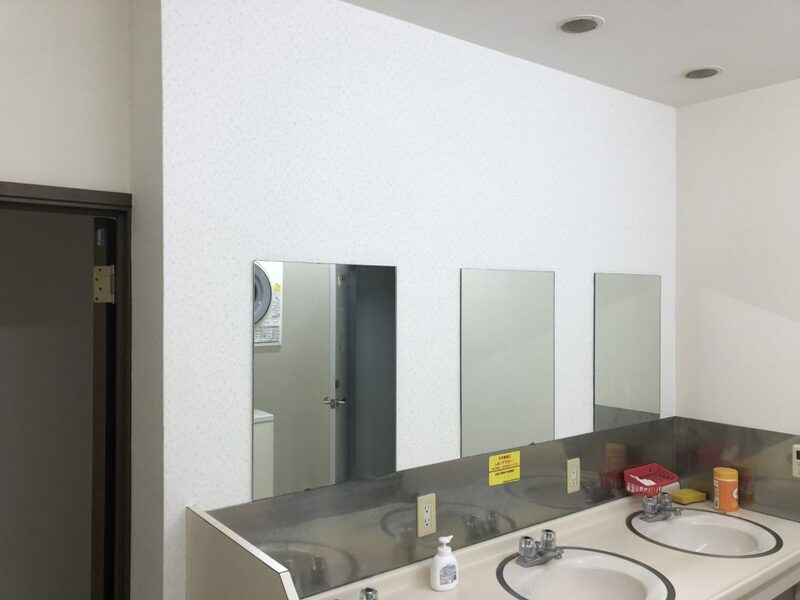 Although it was not particularly dirty, I thought that I want to change the wallpaper around the washstand to a one with a bright pattern. Because the ratio of the women residents now is higher, I put the wallpaper of flower pattern this time. 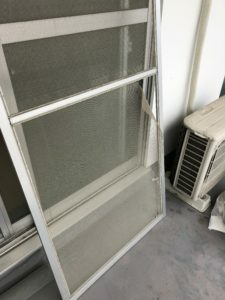 This photo with the first piece attached. 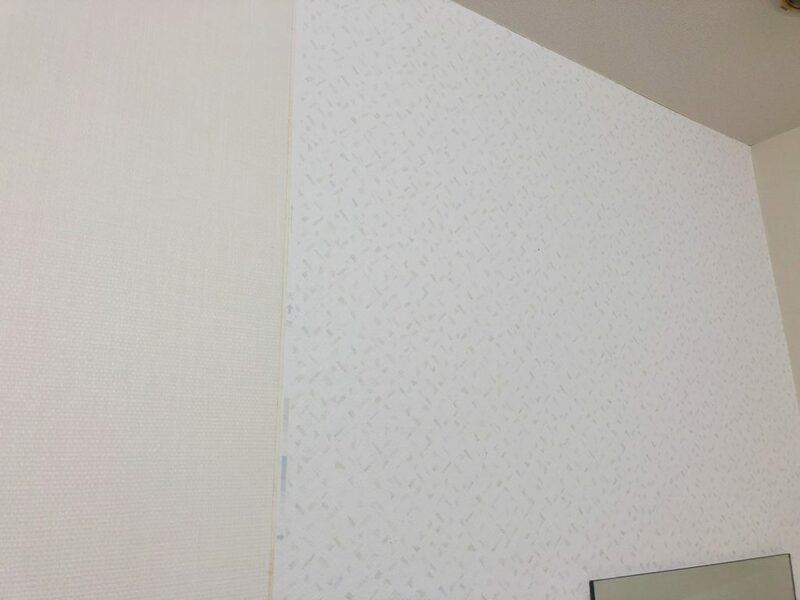 But the new wallpaper is with light blue and light pink, it will you give a sense of cleanliness? In this case, you should come and see this!! It may be a flattering, but it is worthwhile to change it if you can say that. Although there are lots of plants, I will change the overall ornaments around here, the base of this space is white color so I thought from a while ago that I want to add something here as well. 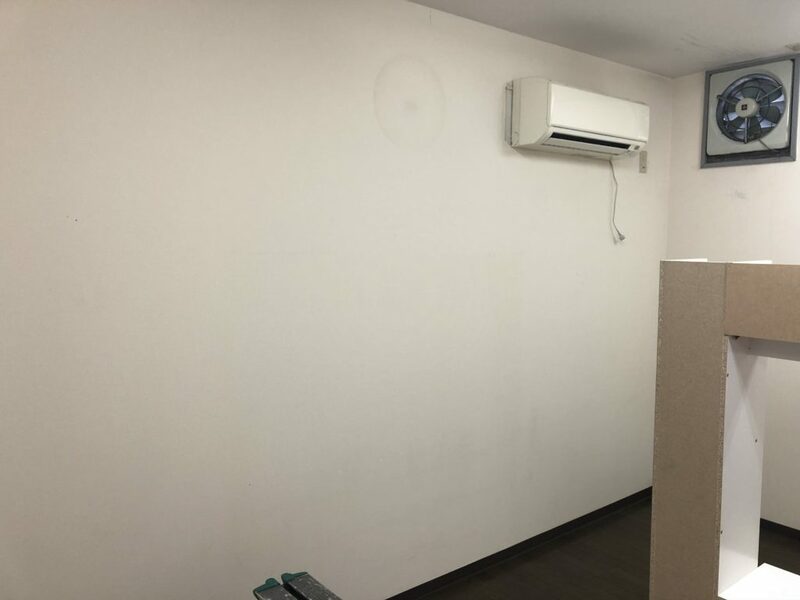 You can see dark marks where there is a clock. I put a woodgrain tone wallpaper, I think that the atmosphere has changed considerably. In order to wipe around the paddy around, I use a cloth that I squeezed with water, but wipe the rust and go to wash the rag, wipe the rag and go to the wash again…. 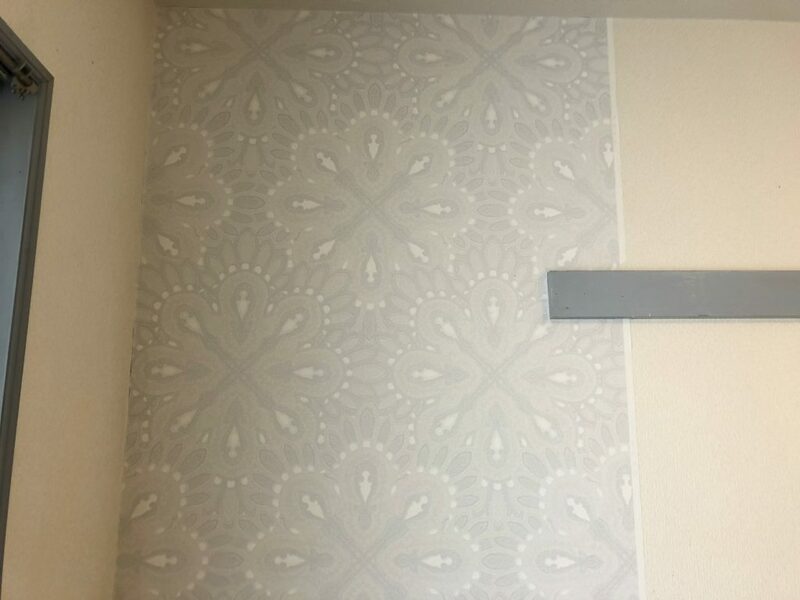 By the way, if you go to the home center, you also find wallpapers with paste, but I always buy wallpapers without paste. 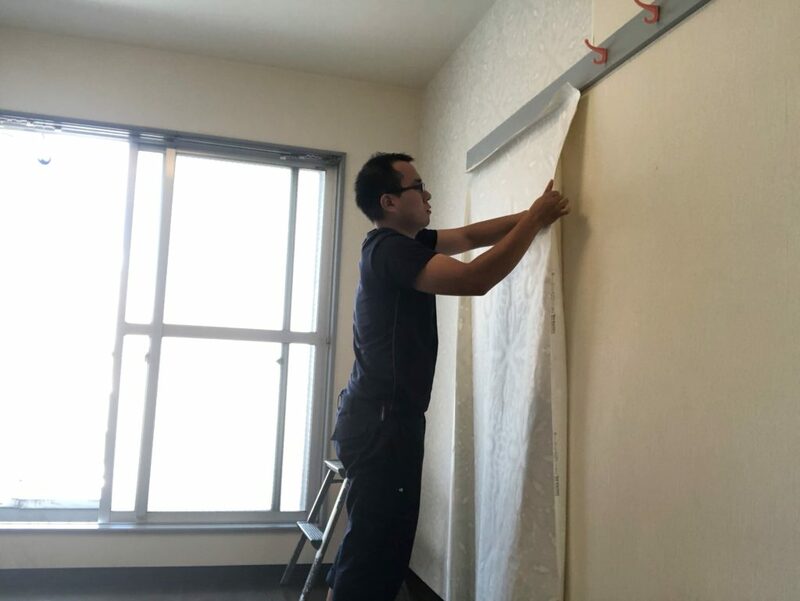 Previously, when using wallpaper with paste, I have a kind of a trauma that the wallpaper has broken since the wallpaper becomes heavy with paste, so I’m doing it without it for a while. It takes much time to just paste starch.. There is a machine for that but it cost about 3,000 US dollars. If I’m engaged only in this task, it might be reasonable to purchase it but I’m not. Originally, because it was white, a red sofa makes a nice contrast. Next time, I will change the wallpaper of the vacancy, so I will try to upload it to our blog again as soon as it is completed. First House Gumyoji evolves from time to time, please look forward to it. Because there is a shared veranda that can afford space in this property, I think that we all want BBQ in the summer! 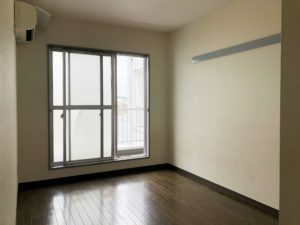 It’s been 1 year since I moved in Firsthouse Yokohama Aoba. Only what I can say is “Fun” if I express my life in the sharehouse. Of course, I sometimes have a hard time as I live in here as the staff. 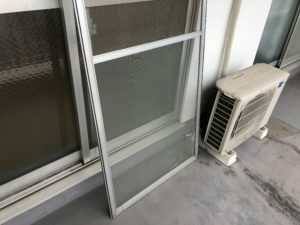 Such that when a resident lost his key at midnight (let me sleep), a drunk stranger was sleeping in front of the house which was scary to residents (he run away when 3 guys of us tried to wake him up), exchanging the garbage bags of common kitchen space on my holiday, residents telling me to replace the toilet paper on my holiday…. But that is all that I am doing for the irreplaceable friends who have chosen the first house Yokohama Aoba and are living inhabitants who continue to live, so it is hard but I have never thought that it is hard. 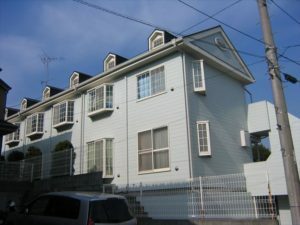 Currently, I feel that share house is often chosen by the reason of low cost in my daily work. 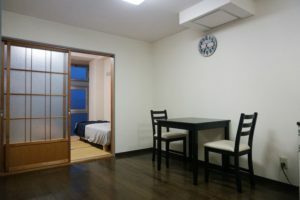 The rent is cheaper than the average in this area, and the utility bill (including the internet ) is fixed 12,000 yen no matter how much people use. But if a resident who thought “it is cheap to live” starts feeling ” Sharehouse is fun! I love staying in the lounge and spending time with people! 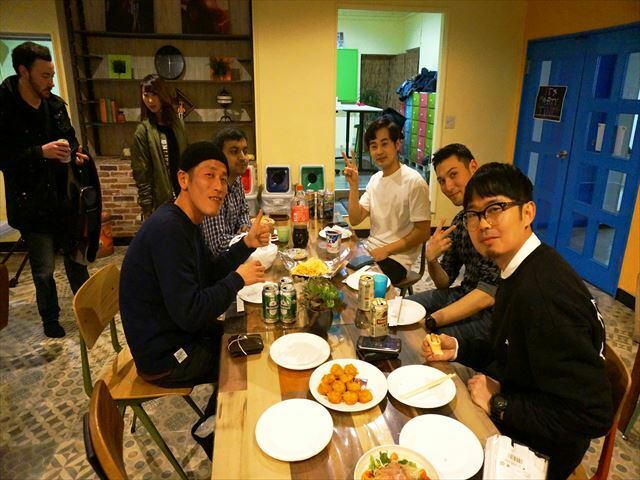 This is sharehouse!”, this is really thankful for me. 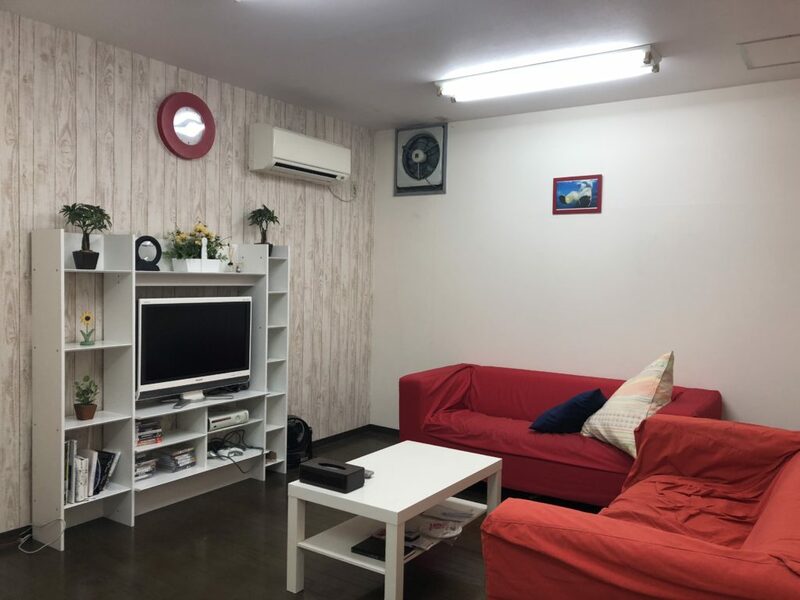 Not just to provide a place to live but my goal is to create a sharehouse where people can experience merits to live in a sharehouse since I started to work here. Don’t you think this wonderful if people talk about the sharehouse after some years have past?? When putting a plate to glasses, it becomes sunglasses. The lens of plate is yellow. Then I noticed that yellow lens is like “Pikotaro”!!! The writer was me who is going back home with listening to the sound of rain in the rainy season. Do you know this news? The big project that a certain train in Kanagawa prefecture is constructed to connect to JR Line and Tokyu Line will be finished in 2022! That is , you can go to Shibuya within 30 min from Tsurugamine station without transferring a train!! Also, the plan of city development is also proceeding according to this project at each station in Soutetsu Line. At Tsurugamine station, the shopping road is prosperous and convenient to live and also there is the zoo park called “Zoorasia Park” so you can enjoy your boy/girlfriend. We expect for more development along this train! 11 min for Yokohama station! Workout is trendy among men and women. Hearing these stories, I always think I will do it, too, but all I can come up with is an excuse, like “If there were a gym nearby”, or “If I could go home early from work”. HOWEVER, there has been a thing lately that refuses these excuses!! That is 24-hour Fitness club!! 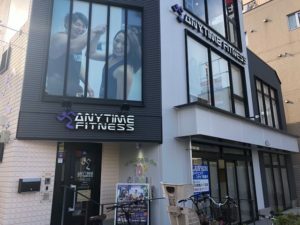 A gym like that has opened, located just 2 minutes’ walk from Nishi-Magame Station on the way to Ma. Maison Nishi-Magome. The house, Ma. 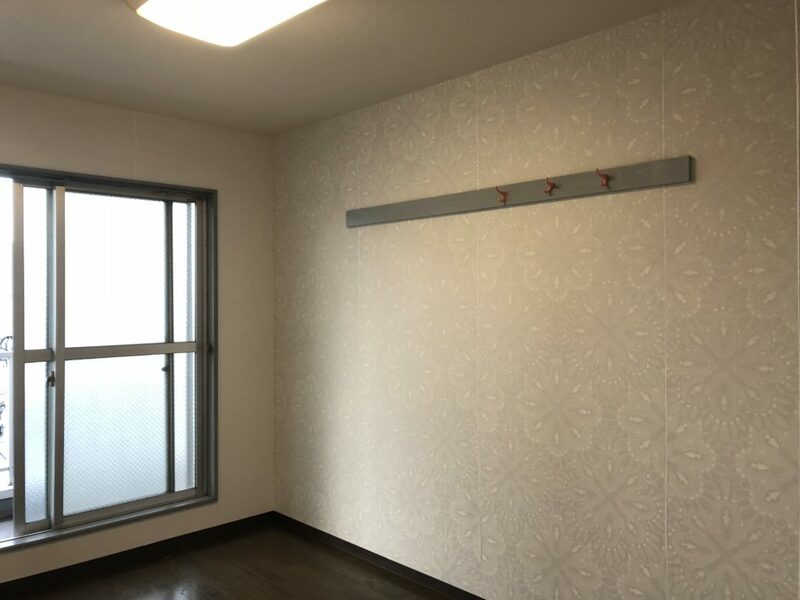 Maison Nishi-Magome, is 4 minutes away from the station; that is, the gym is just 2 minutes away from the property! On the way from the station to the house, you will see the gym even if you are not interested. The best location for workout regularly. Women, who want to keep yourself healthy, just come to Ma. Maison Nishi-Magome!!! Nishi-Magome Station, the first and last station on Toei-Asakusa Line. This station might be unfamiliar to you, but it is actually a convenient station, just 8 minutes to Gotanda Station. From Gotanda, you can take JR Yamanote-Line, easy to get to Shibuya & Shinjuku. Even to Shimbashi Station, it takes only 19 minutes; therefore, it’s convenient for people who work at the metropolitan area in Tokyo. 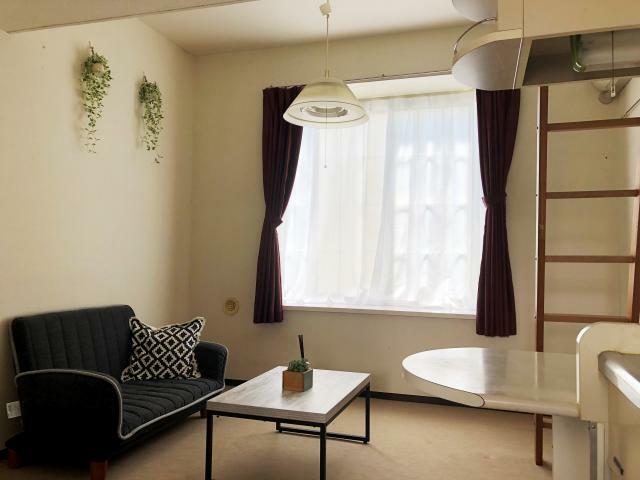 Located just 4 minutes’ walk from Nishi-Magome Station, there is a women-only, furnished apartment including a bathroom, kitchen in your room. That is Ma・Maison Nishi-Magome!! Little-known, but highly recommended!! 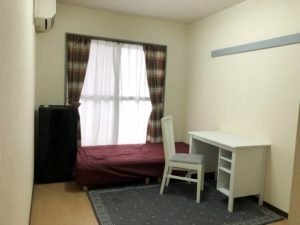 Because there are supermarkets, a drug store, and convenience stores around the station, you will be able to make a comfortable living and just 4 minutes walk is a big advantage!! Even if you go home late, the street in front is not a dark, quiet one. That will give you a feeling of security. Here, I will tell you about a new-opened, stylish cafe close to Ma・maison Nishi-Magome I found!!! The day I took these photos was so windy that the seats at the terrace were closed. But out of curiosity, I peeped into the inside of the cafe, welcomed by a waitress with a big smile. She was so kind as to tell me about the cafe. How kind!! The motif is a “stable” as you can imagine from the name “Cheval (meaning horse in French). 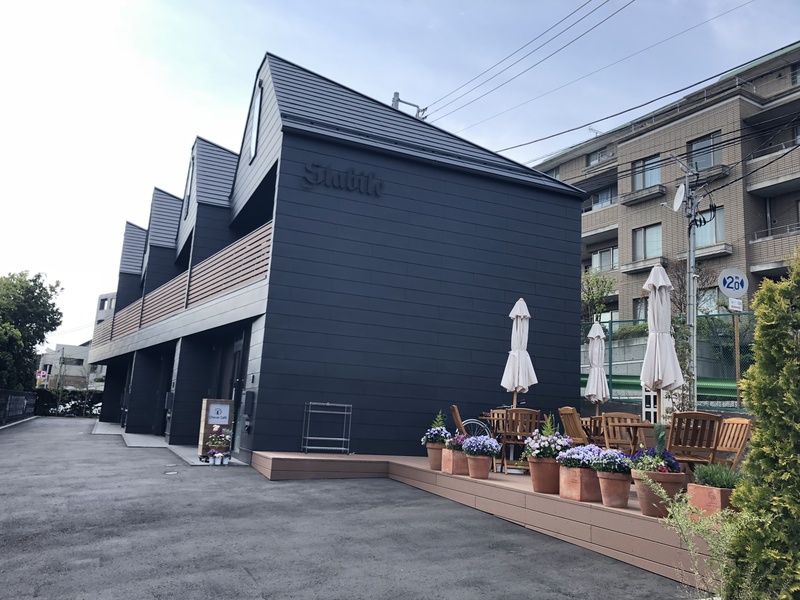 It is a cafe which just opened last December and run by a married couple. Interior and exterior are very nice, and so is the terrace. If interested, please check the URL below!! Meals look delicious! I regret that I just ate Soba an hour before finding this spot. I like to have lunch at the terrace seats on a nice weather day. Also, I personally wish to have a stylish cafe like this near my house!! If you are interested, please visit this cafe and come to our property, too!!!! !